Free shipping. Buy direct from HP. 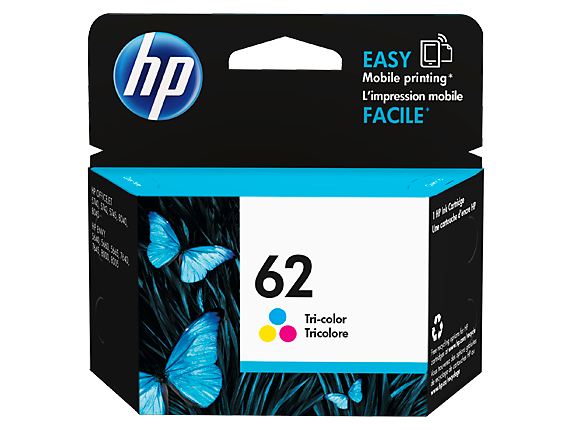 See customer reviews and comparisons for the HP 62 Tri-color Original Ink Cartridge. Upgrades and savings on select products. Original HP high-yield ink cartridges reliably deliver standout, durable color documents and photos page after page. HP ink cartridges are specially designed to work with your HP printer for projects at home, work, and school. Represent your best work with Original HP inks—designed for consistent, standout results.Rely on Original HP ink cartridges for eye-catching prints—and they are designed for smooth, crisp, and clean printing for the entire cartridge.Get reliable performance and produce high-quality prints throughout the life of your cartridge.Better together—choose Original HP ink cartridges specially designed to work with your printer. Make an impression with Original HP inks—designed to consistently deliver standout color page after page.Show off your snapshots. Create store-quality photos you’ll be proud to share—using Original HP inks.Rely on Original HP inks for durable prints and store-quality photos that resist fading and water. Count on eye-catching, professional results that last,  with ColorLok® papers designed for the office. From high-capacity cartridges to multi-packs, HP has the right combination to fit your printing needs.Return Original HP cartridges through HP Planet Partners for free, easy recycling. Easily complete your print projects. Low-ink alerts can help ensure you don’t run out of ink mid-page. Make an impression with Original HP inks—designed to consistently deliver standout color page after page.Show off your snapshots. Create store-quality photos you’ll be proud to share—using Original HP inks.Rely on Original HP inks for durable prints and store-quality photos that resist fading and water.Count on eye-catching, professional results that last, with ColorLok® papers designed for the office. Avoid wasting money on problem prints. Original HP inks are designed to deliver pages you can use.Count on a better value for frequent printing with optional Original HP high-yield ink cartridges. From high-capacity cartridges to multi-packs, HP has the right combination to fit your printing needs.Return Original HP cartridges through HP Planet Partners for free, easy recycling.Easily complete your print projects. Low-ink alerts can help ensure you don’t run out of ink mid-page. 1 Water, smear, and fade resistance based on ISO 11798 and internal HP testing. For details, see http://www.hp.com/go/printpermanence. 2 HP Planet Partners Program availability varies. For more information, visit http://www.hp.com/recycle. 3 Based on HP 62XL High Yield Black Original Ink Cartridge and HP 62XL High Yield Tri-color Original Ink Cartridges. For more information, see http://www.hp.com/go/learnaboutsupplies. High-yield cartridges not included; please purchase separately. Value compared with estimated street price and page yield of standard-yield HP 62 ink cartridges. Actual pricing may vary.